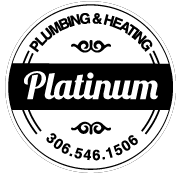 Welcome to Platinum Plumbing & Heating Ltd. We are your professional choice for plumbing, heating and air conditioning work in Regina and surrounding areas. We provide around-the-clock sales, installation and maintenance for residential and light commercial customers. There's no job that's too big or too small for us to handle. From simple fixes to complete renovations, we have the training and know-how to get your job done on time and on budget. Call us whenever you need us. We’re available Monday through Friday, 8am to 5pm, and we are available for emergency calls after hours. Platinum Plumbing & Heating Ltd was established in 2012 under the guidance of 2 business partners, who bring more than 15 years of experience in plumbing, heating and air conditioning. With our team of 5 dedicated employees, we work diligently to go above and beyond to provide exceptional service to each and every customer. Be sure to also 'Like' our page on Facebook to see examples of our quality workmanship in action, and to read reviews from some of our past customers. plumbing, heating and cooling needs. customers have to say about our work. for service or an estimate.